Congestive heart failure occurs when the cardiac output is not adequate enough to meet the demands of the body. This can occur for several reasons, as congestive heart failure is the predominant clinical presentation in multiple disease states. A review of systolic congestive heart failure is presented here. Reviews of diastolic congestive HF, valvular heart disease, right HF and high output HF are presented elsewhere. Congestive heart failure affects approximately 6 million Americans every year and remains one of the most common reasons for hospitalization. Note that the ACC/AHA classification is much different than the New York Heart Association (NYHA) functional class (described below in Symptoms) in that there is no moving backwards to prior stages. Once symptoms develop, stage C heart failure is present and stage B will never again be achieved. In the NYHA classification, in contrast, patients can move between class I and class IV relatively quickly, as these are all designated on symptoms alone. Congestive HF results in the activation of multiple compensatory mechanisms in an attempt to increase cardiac output. These frequently work in the short term; however, the long-term effects can be detrimental to the heart via negative remodeling. The two primary mechanisms — considered the “neurohormonal” response — are activation of the sympathetic nervous system and activation of the renin-angiotensin-aldosterone system. Medical therapy is aimed at reducing the activity of these two systems. A third compensatory response occurs via B-type natriuretic peptide and A-type natriuretic peptide. See the summary image below. When the carotid baroreceptors sense a low blood pressure, one response is to activate the SNS. This increases epinephrine and norepinephrine levels, which act to increase heart rate, contractility and afterload via peripheral vasoconstriction. In the short term, this will work to increase cardiac output and relieve HF symptoms; however, chronically this has deleterious effects and causes further left ventricular systolic decline. Beta-blockers are the primary therapy to reduce this SNS activation. When the renal perfusion is decreased, the kidney assumes hypovolemia — though not always the case, as low cardiac output can also decrease renal perfusion. The inherent compensatory mechanism to retain sodium and water is activation of the renin-angiotensin-aldosterone system. Angiotensin increases afterload via peripheral vasoconstriction, raising blood pressure. The activation of the RAAS has been shown to contribute to negative remodeling of the heart, resulting in even worse overall cardiac function. The RAAS can be blocked by angiotensin converting enzyme inhibitors, angiotensin receptor blockers, aldosterone antagonists and antidiuretic hormone antagonists, as described in Treatment below. Both B-type natriuretic peptide and A-type natriuretic peptide have beneficial hemodynamic effects during HF and represent another natural mechanism to relieve symptoms. They are released primarily in the atrium, as the elevated cardiac pressures stretch the atrial myocytes. They act to vasodilate and cause sodium excretion, resulting in natriuresis. Nesiritide is a B-type natriuretic peptide analog that can be used to treat HF. Endothelin has negative effects in regards to remodeling and vasoconstriction; however, clinical trials of endothelin inhibitors have never shown a benefit, and thus its role remains unclear. There are numerous causes for systolic heart failure, but the most common is related to coronary artery disease and prior myocardial infarctions. This entity is termed an “ischemic cardiomyopathy” and accounts for nearly half of systolic heart failure cases in the United States. Dilated cardiomyopathy is the second leading cause of systolic HF. This can be idiopathic (50% of cases), a viral cardiomyopathy, peripartum and hypertensive heart disease (related or from less common causes). These include doxorubicin therapy, stress-induced (Takotsubo), alcohol-related, selenium or thiamine deficiency, tachycardia-mediated, giant cell arteritis, hyperthyroidism, cocaine use, obstructive sleep apnea and familial cardiomyopathies. The third leading cause of systolic HF is valvular heart disease. This includes aortic valve stenosis, aortic valve regurgitation, mitral valve stenosis and mitral regurgitation. In many developing nations, the most common cause of systolic HF is Chagas disease, which is related to Trypanosoma cruzi and transmitted by triatomine bugs. Recall that right heart failure and diastolic heart failure are different entities from the left-sided systolic heart failure reviewed here. The most common cause of right HF is pressure overload related to left HF. Diastolic HF is most commonly caused by hypertension as a part of “hypertensive heart disease.” Aging of the heart contributes to diastolic HF as well. The general symptoms of congestive heart failure are the same regardless of the etiology and attributed to either fluid retention related to the activated RAAS or low cardiac output. They can also be categorized as from left heart failure vs. right heart failure. Left HF will result in low cardiac output symptoms and transmission of the increased left-sided cardiac pressures into the lungs, causing pulmonary edema and a sense of dyspnea. With physical exertion, the heart demands increased cardiac output that is unable to be satisfied in states of HF, significantly increasing left heart pressures and causing this transient pulmonary edema. Right heart failure symptoms include lower extremity dependent edema. When the legs are elevated at night, the fluid redistributes centrally, causing pulmonary edema that results in orthopnea (dyspnea while lying flat) or paroxysmal nocturnal dyspnea, or PND. Hepatic congestion can occur, causing right upper quadrant abdominal pain. Symptoms related to low cardiac output include fatigue, weakness and, in extreme cases, cardiac cachexia. The New York Heart Association functional classification system helps to categorize patients based on their symptoms of heart failure. Recall that the NYHA functional classification differs from the ACC/AHA heart failure classification, in that the former allows movement from one class to the other while the latter classification does not. The diagnosis of congestive heart failure is predominantly by history and physical, though echocardiography and cardiac catheterization can be beneficial. Physical examination during systolic congestive HF will reveal a S3 heart sound if significant left ventricular dilation is present. A S4 heart sound can be present in diastolic HF. The point of maximal impulse, or PMI, will be laterally displaced and, at times, the S3 can even be palpable. Cardiac murmurs will be present if valvular heart disease is present, contributing to the HF such as aortic stenosis or mitral regurgitation. Physical examination in states of right heart failure may reveal elevated jugular venous pressure including hepatojugular reflux, lower extremity pitting edema and ascites. Pleural effusions may be present and more prominent on the right compared to the left. Echocardiography is indicated in all patients with a new diagnosis of congestive HF to help determine the etiology. The LV systolic function can be measured, including ejection fraction. Diastolic function assessment can help determine the left heart pressures. The cardiac valves can be interrogated for significant regurgitant or stenotic lesions. Cardiac catheterization including coronary angiography is indicated whenever angina symptoms accompany a new onset of congestive heart failure (Class I). If no angina is present, stress testing to evaluate for ischemia as a contributor is recommended. Alternatively, coronary CT angiography can be done when no angina is present to exclude occlusive coronary artery disease. Lifestyle modifications to help decrease the risk for volume overload leading to hospitalization is important. Fluid restriction to about 2 L of all liquids daily should be maintained as well as sodium restriction of 2 g daily. Monitoring daily weights at home in order to dose diuretics on an as-needed or individualized basis is recommended. Educating patients on the importance of medication compliance is crucial to prevent decompensated episodes of HF. There is an abundance of clinical evidence to show many available pharmacotherapies support mortality reduction and symptom improvement in patients with congestive HF. It is important to understand which therapies are the most important and reduce mortality vs. those that relieve symptoms only. Angiotensin converting enzyme inhibitors are a class of oral medications that act primarily through blockade of the angiotensin converting enzyme, known as ACE. This enzyme converts angiotensin I to angiotensin II. Angiotensin II causes vasoconstriction, increasing afterload, and thus increasing systemic blood pressure. Angiotensin contributes to the production of aldosterone, which normally acts to retain sodium and water. Reducing the activity of the RAAS is crucial in heart failure, during which it is overactive and contributes to negative remodeling. ACE inhibitors can reduce the symptoms of HF and have been shown in multiple clinical trials to have a mortality benefit in patients with systolic HF. Doses usually start low, with up-titratration to a predetermined goal dose if the patient is able to tolerate it. Commonly-used ACE inhibitors include lisinopril, captopril, ramipril and enalapril. Angiotensin receptor blockers are a class of oral medications that act primarily through blockade of the angiotensin receptor. Very similar effects on the RAAS are achieved with ARBs as with ACE inhibitors. ARBs are primarily used when a patient with systolic HF is unable to tolerate an ACE inhibitor, frequently due to a cough. These drugs have been shown in multiple clinical trials to offer significant mortality benefit. Beta-blockers antagonize beta-1 and beta-2 receptors — the usual targets of the SNS — including epinephrine and norepinephrine. The overactive SNS has deleterious effects on long-term cardiac function, as described earlier. Three beta-blockers are approved by the FDA in the United States for the treatment of systolic congestive heart failure: metoprolol succinate, carvedilol and bisoprolol. Beta-blockers are contraindicated specifically in systolic HF when pulmonary edema is present and when there are signs of cardiogenic shock, severe bradycardia, hypotension or wheezing related to asthma. Beta-blockers should be initiated in patients hospitalized for acute systolic congestive HF prior to hospital discharge. It is reasonable to withhold beta-blockers in patients previously taking them in the outpatient setting for chronic systolic HF when they are admitted with a HF exacerbation. These drugs have also been shown in multiple clinical trials to offer significant mortality benefit. Aldosterone antagonists (spironolactone, eplerenone) also known as “potassium sparing diuretics” block the action of aldosterone, inhibiting the reuptake of sodium and water. Normally, when sodium reabsorbs, it is exchanged with potassium, which is then excreted. Because aldosterone inhibition decreases sodium reabsorption, it also decreases potassium excretion, resulting in higher serum potassium levels. Spironolactone is indicated (class IIa, level of evidence B) in systolic heart failure with recent or current NYHA functional class IV symptoms, preserved renal function and a normal potassium concentration. Spironolactone was investigated in the Randomized Aldactone Evaluation Study (RALES) trial, and a mortality benefit was shown in patients categorized as NYHA functional class III and IV. Significant hyperkalemia did contribute to sudden cardiac death. The aldosterone antagonist eplerenone was evaluated in the Epleronone Post-Acute Myocardial Infarction Heart Failure Efficacy and Survival Study (EPHESUS) trial, leading to the recommendation for use of the agents with an ACE inhibitor prior to hospital discharge after an acute coronary syndrome if there is LV systolic dysfunction (EF < 40%), either diabetes or symptomatic HF present and no contraindication. A class effect is likely present; therefore, spironolactone is frequently used instead of eplerenone due to cost concerns, though there is no direct data to support this practice. In this population, aldosterone antagonists do give a mortality benefit. Digoxin blocks the sodium/potassium ATPase pump. The mechanism by which this decreases atrioventricular, or AV, conduction is not clear but is perhaps due to increased vagal tone. Intracellular calcium within the cardiac myocytes is increased by digoxin, resulting in increased inotropy (contractility); thus, digoxin is frequently used when atrial fibrillation and left ventricular systolic dysfunction coexist. Digoxin therapy gets a class I indication for the treatment of symptomatic systolic congestive heart failure. Although the Digitalis Intervention Group (DIG) trial showed no mortality benefit, there was improvement in symptoms and fewer hospitalizations for HF. Commonly, if systolic HF is present in combination with atrial fibrillation and an uncontrolled ventricular rate, digoxin therapy is utilized. Digoxin toxicity is a concern, and the dose must be adjusted in the setting of renal failure. The loop diuretics furosemide, bumetanide and torsemide are utilized to help maintain euvolemia in patients with heart failure. These drugs are for symptom relief only and have never been shown to provide mortality benefit. The dose needs frequent adjusting based on the patient’s lifestyle, including fluid and salt intake. Tolvaptan is a vasopressin receptor antagonist. Vasopressin — an antidiuretic hormone, or ADH — helps to regulate water retention by absorbing water in the collecting ducts of the nephron. Blocking this receptor allows water to be excreted more readily. Many patients with heart failure present with some degree of hyponatremia from water retention. Tolvaptan has been shown in more than one clinical trial to increase sodium levels; however, mortality and rehospitalization rates were not improved, and thus the role for this therapy is not well defined. Specifically, tolvaptan is approved by the FDA for the treatment of euvolemic hyponatremia and hypervolemic hyponatremia. Nesiritide is a recombinant form of B-type natriuretic peptide and is used for the treatment of acute decompensated heart failure. Nesiritide has potent vasodilatory properties and reduces pulmonary capillary wedge pressure effectively. This results in improvement of dyspnea. The large Acute Study of Clinical Effectiveness of Nesiritide and Decompensated Heart Failure (ASCEND-HF) trial randomized 7,141 patients to nesiritide vs. placebo. Although nesiritide did improve the symptom of dyspnea compared with placebo, there was no reduction in 30-day rehospitalization and no mortality benefit. Hypotension was significant in the nesiritide group. Nesiritide is not recommended for routine use during decompensated HF. If patients with blood pressures in the normal range are not responding well to typical management with loop diuretics, nesiritide can be considered. Hydralazine is a direct arterial vasodilator that decreases afterload. Isosorbide mononitrate is a long-acting oral nitrate that decreases preload. The combination of these two drugs has an effect similar to that with an ACE inhibitor or ARB, without reducing renal function or causing hyperkalemia. The combination of hydralazine and nitrates, however, does not have the neurohormonal blockade benefit of ACE inhibitors or ARBs, which is thought to play an important role. Despite this, a clear mortality benefit has been present with this combination when ACE inhibitors or ARBs are contraindicated, especially in the African American population. The treatment of heart failure with therapies other than medications, such as the use of devices, is considered mechanical therapy. This includes biventricular pacing, implantable cardioverter defibrillators and left ventricular assist devices. Biventricular pacing is an excellent option for certain patients with advanced heart failure. Also known as “cardiac resynchronization therapy,” biventricular pacing has been shown to improve HF symptoms in a majority of cases. The normal cardiac conduction system delivers the electrical impulse to both the right and left ventricles simultaneously; however, in the presence of a left bundle branch block or right bundle branch block, the electrical impulse will reach one ventricle first, then slowly transmit to the other, causing “cardiac dyssynchrony.” Remember that a LBBB and RBBB, by definition, prolong the QRS duration. A meta-analysis showed a mortality benefit for those patients with a QRS duration of greater than 150 ms who receive biventricular pacing, but not those with a QRS duration less than 150 ms. Many patients who are candidates for biventricular pacing also receive an ICD at the same time. When atrial fibrillation is present, and the QRS complex occurs at random intervals, the biventricular pacing device does not know when to initiate atrial pacing, and may not be able to initiate biventricular pacing (if the native QRS complex comes earlier than expected). This results in less beneficial effects on cardiac output and thus symptoms. Therefore, it is recommended that any patient with permanent atrial fibrillation undergoing biventricular pacing also have AV nodal ablation performed, thereby eliminating the unpredictability of the onset of the QRS complex and allowing for near 100% biventricular pacing. An implantable cardioverter defibrillator is a permanent device in which a lead (wire) inserts into the right ventricle and monitors the heart rhythm. It is implanted similarly to a pacemaker, and the generator lays in the upper chest area. Therapies are delivered in the form of anti-tachycardia pacing or shocks to convert to sinus rhythm from sustained ventricular tachycardia or ventricular fibrillation — both of which are life-threatening rhythms. Patients with systolic HF (NYHA functional class II or III) and an ejection fraction less than 35%. Optimal medical therapy must be present, and at least 3 months must have elapsed (in case systolic function recovers to an ejection fraction > 35%) in both non-ischemic cardiomyopathy patients and ischemic cardiomyopathy patients who underwent bypass surgery. Patients with documented cardiac arrest from sustained ventricular tachycardia, ventricular fibrillation, or documented hemodynamically-stable sustained ventricular tachycardia even if the LV ejection fraction is greater than 35%, as long as no reversible cause is identified. The above must not be within 48 hours of an acute coronary syndrome. A left ventricular assist device is a surgically-implanted cardiac assist mechanism that essentially acts like a heart. One cannula sits in the left ventricle and pulls blood out of the body into its chamber, where it pumps blood to the second cannula that is inserted into the aorta. When a patient becomes volume-overloaded and presents with an acute episode of symptomatic heart failure, the term “heart failure exacerbation” is used. Determining the etiology of heart failure exacerbation is crucial in order to direct medical therapy appropriately — not only to improve the current HF symptoms, but to prevent recurrence. Dietary noncompliance: Consuming large amounts of fluids and/or sodium can result in volume overload, causing symptoms of HF and eventual pulmonary edema. Medication noncompliance: Frequently, diuretics are not taken as prescribed due to the urinary side-effects. Also, uncontrolled hypertension from not taking other CV medications can contribute. Ischemia: Acute coronary syndromes or progression of ischemic heart disease can cause HF exacerbations. All patients with HF in the hospital should have at least one ECG performed, as well as cardiac enzymes. Arrhythmia: Multiple different arrhythmias can occur in patients with HF, resulting in volume overload from reduced cardiac output. These include atrial fibrillation and ventricular tachycardia. 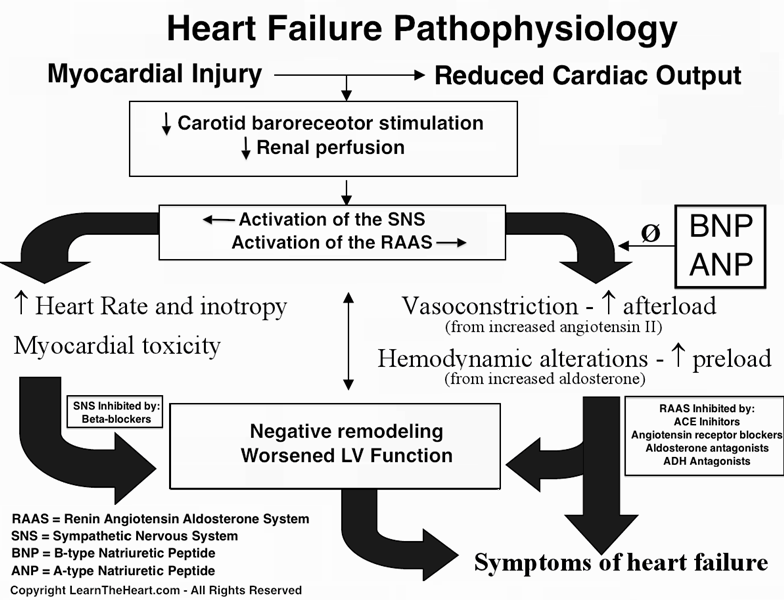 Progression of heart failure: Worsening of the cause of the patient’s HF, such as progression of valvular heart disease or further LV systolic decline in ischemic or nonischemic cardiomyopathies, can trigger HF exacerbations. Noncardiac illness: Pneumonia, severe sepsis and gastrointestinal bleeding are examples of conditions that require a higher cardiac output. In patients with already reduced heart function, these can trigger clinical HF. Heart transplantation is considered a last resort therapy for end-stage heart failure when the above-mentioned therapies fail. Refractory heart failure patients should be referred to a HF program capable of heart transplantation ― especially if cardiopulmonary stress testing shows the maximal oxygen consumption, or VO2 max, is less than 10 mL/kg. Heart transplantation can improve survival in carefully selected individuals. The surgical process itself has an approximate 5% mortality rate. Afterwards, immunosuppressant drugs including prednisone, cyclosporine and tacrolimus must be utilized in order to prevent rejection. Heart transplantation is contraindicated in patients with severe fixed pulmonary hypertension, malignancy, any significant illness with limited survival and any illness that would be highly likely to occur in the transplanted heart. It is only a relative contraindication to be older than 70 years. Survival with heart transplantation is steadily improving. Most patients now live at least 10 years after transplantation, with the highest mortality rate within the first 6 months of transplantation. Status 1A: The most critically ill patients. These patients must be hospitalized and in need of mechanical or pharmacological support to sustain life (i.e. intra-aortic balloon counterpulsation, LVAD, high doses of intravenous inotropic therapy); they are NYHA functional class IV. Status 1B: Less critically ill patients, but still seriously impaired. These patients may have outpatient daily inotrope infusion; they are NYHA functional class III or IV. Status 2: The least urgent patients. These patients rarely receive transplantation because organs are in short supply and offered to status 1A or status 1B patients first; they are NYHA functional class II or III. 3. Jessup M and Brozena S. Heart Failure. N Engl J Med. 2003;doi:10.1056/NEJMra021498.